When silverfish start to appear in a home, it can be quite frustrating. These tiny, silver insects aren't just creepy bugs, they can create a number of problems as they search for food. What do silverfish eat? Starch, in all its many forms. From the starch found in sugary foods to starches found in the glue that holds your wallpaper onto your walls. This love of starch will have them doing more than just invading your pantry. They can damage valuable garments, curtains, bedding, old photos, important documents, your favorite books, and more. When these fish-like bugs appear, it is time to take action and get rid of them. Here are a few suggestions. Silverfish are primarily moisture pests. That is why you usually find them in your basement areas and in your bathroom. Adding a dehumidifier in your basement, fixing leaky or weeping pipes, and drying up any areas of moisture, will go a long way to letting silverfish know they are not welcome. There isn't anything you can do to keep your bathroom dry all the time, but installing ventilation can make the moisture left over after a shower go away faster. And, while technically not a "way to get rid of silverfish," it is a good idea to clear obstructed gutters and fix leaks in outside spigots to make the exterior of your home unwelcoming as well. But be aware that keeping things dry is not a foolproof way to get rid of silverfish. If there is an abundance of food, they can live in dry places. Don't let them eat. There is no way to hide all of the food silverfish eat, but protecting known food sources, such as keeping coffee, sugar, and other starchy pantry items in sealed plastic containers, can resist them. This is, however, only one part of a larger pest control plan. For instance, if you have an infestation in your garage, you may be able to get the infestation under control by cleaning the area (removing food), drying things out (removing moisture), and sealing things up (keeping new silverfish from getting in). Natural repellents. You may find limited success driving silverfish out, or keeping them out, by using natural repellents such as cinnamon, citrus oils, cloves, bay leaves, or sage. Some people even find cucumbers to be helpful in driving silverfish out. We would, however, not recommend leaving cucumbers to rot around your home. And it is important to note that natural repellents like cinnamon, do not kill silverfish or their eggs. Therefore, they do not attack the problem at its core. Traps. There are some traps, when used as part of a larger protocol, that can help to reduce or eliminate silverfish. But traps alone are not a solution. If you don't address the core problem that led to your silverfish infestation, you will continue to have silverfish invading your home. Professional pest control. This is the best way to get rid of silverfish. These moisture pests live in places that are hard to get to. A professional is not only trained in the habits and habitats of these insects, they have an education in the accepted pest control practices that work to fully exterminate all of the silverfish in a home. Pest technicians use a mixture of methods that include detailed inspections, installation of pest products, and ongoing monitoring of pest activity. And, a pest control expert knows which products and techniques are needed for all types of infestation. The protocol needed to deal with silverfish in an attic will vary from those used to arrest a silverfish problem in a basement. And a pantry infestation will require different measures than an infestation found in an outside storage area. A professional will also deal with secondary pest issues that can result from silverfish, such as an infestation of centipedes, spiders, or earwigs. There are many ways to repel, deter, and kill silverfish, but completely ridding a home of silverfish is usually only something a professional pest technician can accomplish. If you're dealing with these bugs in your Maine home, let Big Blue Bug Solutions help. We don't just deal with big blue bugs. We deal with tiny silver bugs too. Are you finding silverfish on your bathroom floor? It isn't surprising. Silverfish are a common pest problem in New England, and bathrooms are a commonplace they're seen. But your bathroom is not the only place those insects will hang out. We have had the most pleasant and capable technician, Kevin Tidd, resolve an extremely complex case of Yellow Jacket infestation. We had an opening on the outside of our house that led into the space above the drop ceiling in our mud room. It was a very limited space above a closet and he diligently and professionally addressed the problem. After completion, he cleaned up and restored the area. While We have always had very positive experiences with New England Pest Control, he was truly…"
I'm a firm believer in local, family-run business. 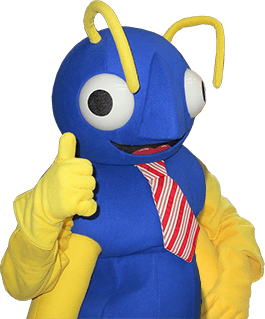 Big Blue Bug Solutions is a part of the community I call home--and when a company has been around for over 80 years, I know they're doing it right." of service professionals because of his thorough knowledge…"
Just wanted to let you know that my service representative, Steve Martinez, was excellent in customer service today... Monday, August 2nd. Kudos to him for being pleasant, professional, informative and courteous. I hope all my bugs disappear! Thanks again NE Pest Control."